Since this blog is primarily going to be concerned with how the comic came together, it's going to be mostly living in the past. But every once in a while I'll share with you what's going on right now. Here's me at this past weekend's New York Comic Con, rocking the very latest in fashion: my Hero House t-shirt (a very thoughtful X-Mas gift from my very thoughtful penciller, Mike Dimayuga). 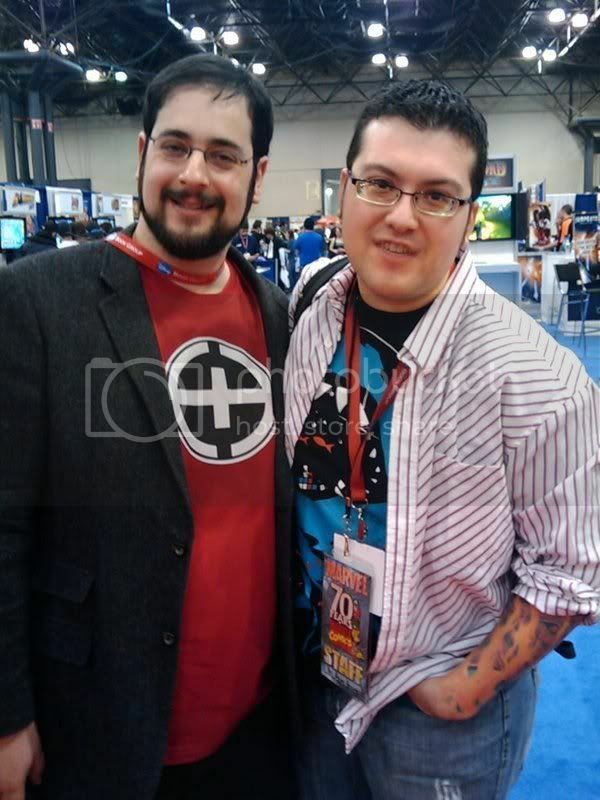 I could be spotted sporting the shirt on two panels that I moderated, as well as walking the floor, like I was when I got my pic snapped here with my buddy, Marvel.com editor Ryan Penagos. So that's where we are right now - the book's almost but not quite done, and the merchandising has already begun. I hear that's where the real money from the comic comes from. Keep an eye out for the Hero House flamethrower. Kids love it. Nate Hedges IS Turbine the Turbo Teen!